14 mad first-half minutes set Leinster on the way to an eight-try rout and sealed a quarter-final. THIS WASN’T SUPPOSED to be another comfortable home win for Leinster. Long before Frans Steyn aimed a swinging arm at Johnny Sexton’s head to take a 25th minute red card, this was billed as Leinster’s toughest game of the season. They attacked it as though it was too. And a little sprinkling of Isa Nacewa magic had them well on the way to the bonus point victory even before one 10 cemented the other. “The equation is simple,” said head coach Leo Cullen pre-match. Win the game and a quarter-final was secure. But it was far from safe, cup rugby the home side set out to play. From the off, they ran penalties out of their own 22 and the invited high pressure from Montpellier brought about one or two heart-stopping moments when passes didn’t quite stick. It wasn’t long before the hosts set the pulse racing at the other end though. Nacewa first latched on to Garry Ringrose’s offload on a beautiful angle through the defensive line. The breach bred confidence and Rory O’Loughlin was next to have a cut. This time, the scrambling defence was not enough for the visitors and the blue shirts fanned out right to give Sexton a number of targets to fire a long skip pass at. Sexton was striking difficult conversions cleanly to leave his side with a 14 -3 advantage and thirst for more when all hope was lost for Jake White’s side. The onslaught was all too much for Steyn to handle and the Springbok unleashed a high hit on his opposite number to leave Sexton crumpled on the ground. A guaranteed red card since the rules were underlined on 3 January. Ross Byrne was on the field as Sexton left for a HIA and Nacewa booted the resulting penalty. Leinster were in a swagger. Adam Byrne broke free down the right, bouncing a pass to Conan who returned an offload to let the wing dot down. Three tries in the space of 14 minutes and Sexton back on the field, but the RDS had to wait until the second half for the bonus point to be guaranteed. When Nacewa departed the fray minutes after the start of the second half with the score still 24 – 3 – hopefully as a precaution against the biting cold January air - Byrne dutifully picked up the game-igniting baton. Despite the Kildare man’s hunger for work, it was Conan’s raw power than brought about Leinster’s fourth. Job done, Sexton withdrawn and time to worry about the margin of victory which may come in to play as to break ties in the chase for a home quarter-final. This was a night when the old Leinster killer instinct was on full display. Having gone into the game hoping for a win of any shape or margin, they ended up easing past the 50 mark, Montpellier wilting as tries were gleefully eaten up by Luke McGrath, Cian Healy and then Garry Ringrose after the completion of Conan’s hat-trick. With a 54-point margin of victory, the equation is now an even simpler one for Leinster: win in Castres, and there will be a Champions Cup quarter-final in the Aviva Stadium come April. Mikheil Nariashvili (Yvan Watremez ’52), Shalva Mamukashvili (Charles Geli ’40), Jannie Du Plessis (Davit Kubriashvili ’52); Paul Willemse, Konstantine Mikautadze (Antoine Battut ’40); Fulgence Ouedraogo (Kelian Galletier ’63), Akapusi Quera (Henry Immelman ’26), Pierre Spies. Email “Conan power, Isa magic and a red card see Leinster cruise past Montpellier into 1/4 finals”. 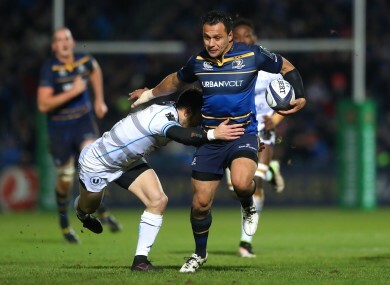 Feedback on “Conan power, Isa magic and a red card see Leinster cruise past Montpellier into 1/4 finals”.